Tacoma or Tundra? Picking the Perfect Toyota Truck. Have you found yourself torn between the mid-size 2016 Toyota Tacoma and the full-size 2016 Toyota Tundra? At Limbaugh Toyota we understand! Both are excellent trucks and each has their own set of advantages. If you are trying to choose which truck is right for you, here is a rundown of what each model has to offer. When it comes to performance, both the 2016 Toyota Tacoma and the 2016 Toyota Tundra have strong, tough engines. 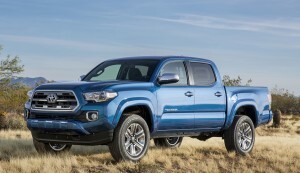 The Tacoma comes with either a 2.7-liter V6 or a 3.5-liter V6. 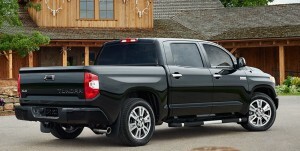 The Tundra boasts either a 4.6-liter V8 or a 5.7-liter V8. The Tundra has 278 horsepower with the 3.5-liter V6, while the Tacoma offers 381 horsepower with the 5.7-liter V8. In terms of fuel economy, the mid-size Tacoma gets an average of 19mpg in the city and 24mpg on the highway*. The larger Tundra averages about 13mpg in the city and roughly 18mpg on the highway*. If you are looking for fuel efficiency, then clearly the 2016 Tacoma is the right choice for you. The biggest and most obvious difference between the two models is their size. The smaller Toyota Tacoma has less room and less towing power, but it offers much better fuel efficiency and it is much more maneuverable. The Toyota Tundra has a more spacious interior cargo area and boasts more power, which is great for towing boats or trailers, but its mpg is not comparable to that of the Tacoma. Depending on what you need to get out of your vehicle, either the Tacoma or the Tundra could be the right choice. There are many advantages and disadvantages to each, but in choosing either, it is hard to go wrong. Come down to Limbaugh Toyota to see for yourself! *EPA estimated ratings. Actual mileage will vary.